For the dozen or so years of this column’s existence, the Riders of Caesar Rodney High School have been the premier Henlopen Conference rivals for the Cape Henlopen Vikings golf team. 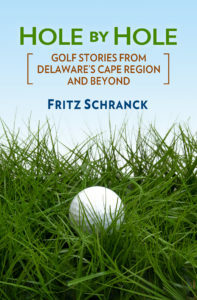 In recent years, however, the rivalry has been a bit one-sided, and the April 19 match at Rehoboth Beach Country Club was no different. The first-place Riders easily handled Cape, 156-189. Devin Medd was best for the Vikings with his 43, but that was seven strokes behind the medalist. Shane Ghigliotty took second place for Cape with his 44. Nick Purnell contributed with his 46, while James Fenstermaker finished the Cape team scoring with his 48. The loss put Cape’s season record at 5-2, as the squad took off for spring break. Inglis thinks his young team can win the rest of their matches, however, which restart May 2 with a rescheduled match against Delmar High School at Green Hill Yacht & Country Club. The team then plays host May 3 to both Dover High and Indian River High, at Rehoboth Beach CC. This year’s spring golf trip with the Conlon Brothers featured an extra twist or two. We traveled to Duck, North Carolina for our group’s first experience with Outer Banks golf. The 5-hour drive to our beautiful but huge beach home in Duck was uneventful, but that evening brought tornadoes to the area. One of these twisters took out The Pointe, the first golf course on our itinerary. The Kitty Hawk, NC course suffered damage to several greens, and dozens of uprooted trees. One staffer noted that the tornado just missed their clubhouse. He also said the storm provided one dividend–a now-unimpeded view of Albemarle Sound from that clubhouse. Fortunately, we had tee times set two days later with The Pointe’s sister course, the Carolina Club, and they were very accommodating. We ended up playing that course twice, because The Pointe simply couldn’t recover in time for us to play it. Carolina Club, in nearby Grandy, had perhaps the smoothest, fastest greens on all of the courses we played (252-453-3588). It was an eminently fair layout for newcomers, with no hidden features to bedevil us. That’s not to say it didn’t present any risks, however. The Conlon brother driving the golf cart I was riding shared my interest in seeing where one of our playing partners had driven his tee shot. Unfortunately, that meant no one was watching as our cart’s front left wheel hit an extremely unforgiving bridge abutment. I escaped with a bloody nose and a bruised hand, both of which slammed into the cart’s roof pillar. The driver was unharmed–naturally. We both re-learned a lesson about safe golfing, however. We also played Kilmarlic Golf Club, a pretty and challenging layout in Harbinger, NC (252-491-4220). I thought that the 6001-yard gold tees completely deserved their 134 slope rating. The Currituck Club’s course in nearby Corolla was the closest to our beach house, and it was a gorgeous place to play, even with the high winds we faced on many holes (888-453-9400). Several holes ran along the edge of Currituck Sound, with other holes presenting significant elevation changes on the turfed-over dunes. Our last round took place at Nags Head Golf Links, on yet another windy day (800-851-9404). Instead of the usual prevailing westerlies, however, the 20-25 knot winds came out of the north-northeast. For several holes, therefore, this meant we played two to three clubs more than usual, on a tight course that demanded straight, careful play. Most of us felt it was a very good thing we were playing a scramble from the blue tees, under those conditions. Despite the opening-round twister, our group really enjoyed our Outer Banks golf experience. I expect we will be adding it to our normal rotation of spring golf trip destinations.